"This upright model is easy to use and impressively powerful, earning it near-perfect reviews from thousands of happy customers." "Provides up to 40 minutes of powerful suction per charge, and it boasts a HEPA filtration system to remove allergens from your home." "On the more expensive end of the spectrum, but it’s sure to exceed your expectations when it comes to sheer cleaning power." "While it doesn't boast as long a runtime as the newer V8 model, it still performs incredibly well in a variety of situations." "Provides up to 30 minutes of suction per charge. It includes a variety of attachments to help you clean upholstery and tight corners." "Comes with a tangle-free turbine tool to help you remove pet hair from carpets and furniture, and reviewers say it's absolutely worth the price." "Will help you keep the hardwood, tile, and other hard floors in your home sparkling clean." "Specially engineered to remove allergens from your home thanks to its HEPA filtration system and radial root cyclone technology." For a top-rated Dyson vacuum cleaner that does it all and comes at a reasonable price, your best bet is the Dyson Small Ball Multi Floor Upright Vacuum Cleaner. This upright model is easy to use and impressively powerful, earning it near-perfect reviews from thousands of happy customers. Weighing just over 12 lbs, the Dyson Small Ball upright vacuum is easy to carry, yet still delivers powerful suction. It has an advanced self-adjusting cleaner head that seals in suction whether you're on hard floors or carpet, and the cleaner head features carbon fiber filaments to catch fine dust particles. The vacuum's ball technology lets you easily steer it into tight corners, and the retractable handle saves you up to 50 percent on storage space. Reviewers love how lightweight this vacuum is, writing that it's easy to move around multi-level homes. Many note that easy to maneuver and empty, and it picks up dirt and debris that other vacuum cleaners would likely leave behind. If you're looking for an incredibly lightweight, portable vacuum cleaner with impressive suction power, you can’t go wrong with the Dyson V8 Absolute Cordless Stick Vacuum Cleaner. It may not look like much, but this cordless vacuum is a favorite among customers. This vacuum’s cordless design provides up to 40 minutes of powerful suction per charge, and it boasts a HEPA filtration system to remove allergens from your home. Its cleaner head drives bristles deeper into carpet to remove as much dirt as possible, yet the stick vacuum is still safe for hard floors thanks to its soft roller cleaner head. The main downside of this model is the canister only holds around 2 cups of debris, so you may have to empty it frequently if you're vacuuming a large area. Despite this, reviewers rave about the convenience of this stick vacuum, writing that it performs wonderfully and is lightweight and easy to maneuver. Check out our guide to the best stick vacuums you can buy today. For more canister space and unlimited runtime, you might prefer a model such as the Dyson Ball Multi Floor Canister Vacuum. This vacuum is on the more expensive end of the spectrum, but it’s sure to exceed your expectations when it comes to sheer cleaning power. This multi-floor canister vacuum has a control switch on the handle that lets you alternate between hard floors and carpets. It's engineered for dust removal and features a whole-machine HEPA filtration system. 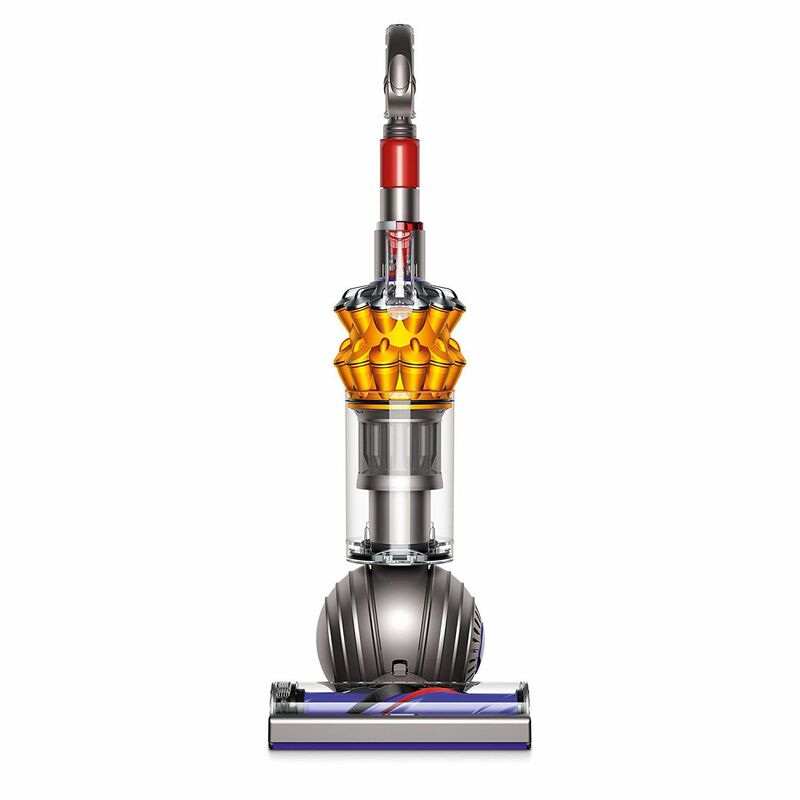 The Dyson Ball Multi Floor Canister Vacuum is heavier than other models at close to 17 lbs, but its turbine head is controlled at the handle, making it easy to maneuver. Reviewers are consistently impressed with the suction power of this vacuum, writing that cleans multiple floor services efficiently and is easy to use. Check out our guide to the best canister vacuums you can buy today. Cordless vacuums provide unparalleled portability, as you don't need to search around for a nearby outlet to clean up messes. If you're looking for an affordable cordless vacuum, consider the Dyson V6 Cordless Stick Vacuum. While it doesn't boast as long a runtime as the newer V8 model, it still performs incredibly well in a variety of situations. This cordless stick vacuum weighs just a few pounds and provides 20 minutes of suction per charge. The cleaner head features a combination of stiff bristles and soft carbon fiber filament to remove dirt from both carpets and hard floors, and the high-speed motor is designed for powerful suction. According to reviewers, this cordless vacuum is one of the best they’ve ever used. Many say it's lightweight, easy to maneuver, relatively quiet, and picks up an impressive amount of dirt. Check out our guide to the best cordless vacuums you can buy today. Looking for a handheld vacuum to help clean up messes around the house? Then you'll love the Dyson V7 Trigger Cordfree Handheld Vacuum, a powerful little machine for all your daily needs. This cordless handheld vacuum weighs just a few pounds, and it provides up to 30 minutes of suction per charge. It includes a variety of attachments to help you clean upholstery and tight corners, and it’s designed to capture even the smallest particles. Other handheld vacuums simply don't compare to the Dyson V7 Trigger Cordfree Handheld Vacuum, if you believe reviewers. While it is on the expensive side for a handheld vacuum, it will do an amazing job cleaning up your home and last you for years. Check out our guide to the best handheld vacuums you can buy today. It can be tough work to keep your home clean if you have one or more pets, which is why Dyson has a special line of vacuums just for animal owners. One of the best options available today is the Dyson Ball Animal 2 Upright Vacuum, which is worth every penny according to happy reviewers. Weighing in at just 15 lbs, the Dyson Ball Animal 2 is an upright vacuum cleaner that delivers both in terms of power and efficiency. It features an advanced self-adjusting cleaner head that switches between carpets and hard floor with ease, and it has the strongest suction of any vacuum, so it can easily pull dirt and hair from carpets. Plus, it also features an instant-release wand and long-reach hose to clean under furniture and even up walls. This Dyson vacuum comes with a tangle-free turbine tool to help you remove pet hair from carpets and furniture, and reviewers say it's absolutely worth the price. Many note that the suction is unparalleled and the machine is incredibly durable, even if you clean your home multiples times per week. Check out our guide to the best vacuums for pet hair you can buy today. If you live in a home without much carpet, you may not want a multi-surface vacuum cleaner. Luckily, there’s the Dyson V7 Motorhead Cordless Stick Vacuum Cleaner for Hard Floors, which will help you keep the hardwood, tile, and other hard floors in your home sparkling clean. This specialized vacuum cleaner features a soft roller cleaning head that's designed to capture both large debris and fine dust in one pass. It provides around 30 minutes of run time per charge, but thanks to its impressive performance, most reviewers agree that's all you need to get your home clean. The majority of reviewers say this is a great vacuum if you mostly have hardwood or laminate floors in your home, writing the suction is powerful and it's easy to operate. The only complaint people have is the limited runtime per charge. Check out our guide to the best vacuums for hardwood you can buy today. Allergy season can be particularly tough if you don't have a high-quality vacuum to remove allergens and dust from your home. If you're looking for a vacuum to help fight back against allergies, consider the Dyson Ball Allergy Upright Vacuum Cleaner with Extra Cleaning Tools. While this vacuum comes at a premium price, it's specially engineered to remove allergens from your home thanks to its HEPA filtration system and radial root cyclone technology. Plus, it includes several additional cleaning tools that will help remove allergens from underneath furniture and even from your mattress. 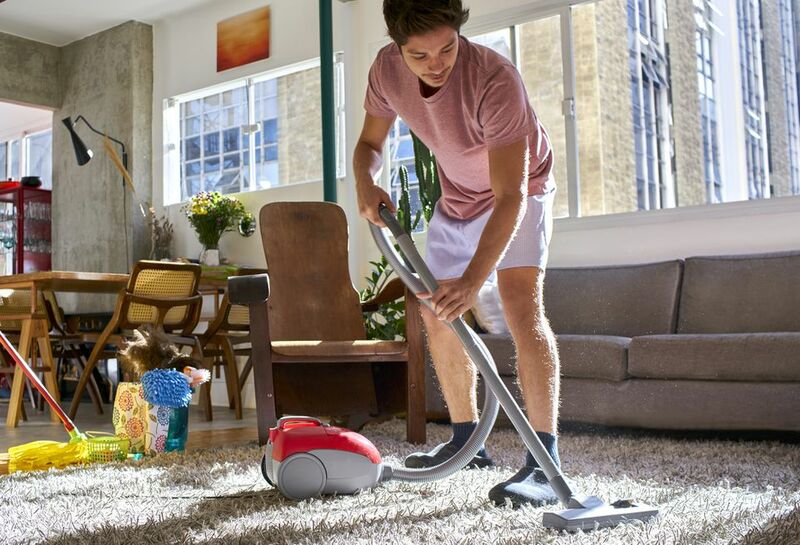 Reviewers write that this vacuum provides unbeatable suction power, leaving their home cleaner than ever before. It performs well and both carpet and hardwood and can even tackle tough pet hair with ease.